Bio: Mark Owkes is an Assistant Professor in the department of Mechanical and Industrial Engineering at Montana State University. He earned a BS in Mechanical Engineering from Clarkson University in 2008. He subsequently attained an MS in Mechanical Engineering from the University of Colorado at Boulder in 2011 under the direction of Prof. Olivier Desjardins. He continued his work under Prof. Desjardins at Cornell University where he earned his Ph.D. in May 2014. Mark’s research interests include the development of numerical methods for capturing gas-liquid interfaces in multiphase flow simulations. His simulations of primary atomization provide insight into the physical phenomena important in the break-up of a liquid jet into droplets. Notably, he has developed both a level set and a volume-of-fluid interface capturing schemes and multiple approaches to compute the curvature of a gas-liquid interface which is important for accurate surface tension forces. Gas-liquid flows exist within many engineering devices including fuel injectors, wave energy extraction devices, fire suppression systems, and PEM fuel cells. 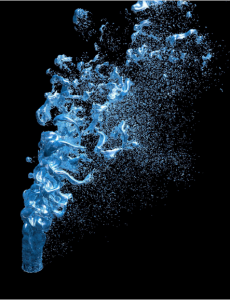 Many of these flows are challenging to explore experimentally and computational fluid dynamics (CFD) simulations offer an alternative and useful approach to advance our understanding. For example, the breakup of liquid fuel into droplets via atomization has a direct effect on combustion efficiency and pollutant formation, yet a fundamental understanding of the complex process is absent. Laboratory experiments are inherently difficult to conduct because atomizing jets produce a large number of opaque droplets that hinder optical access to the breakup dynamics. With increasing computational resources and advancements in numerical methods, computational fluid dynamics (CFD) has emerged as a promising tool to investigate the fundamental nature of atomization. In this presentation, I will present an overview of difficulties arising due to the discontinuities that exist at the gas-liquid interface and recent advances in numerical methods that overcome these challenges. Then I will discuss efforts to improve the the usefulness of the very large data-sets that result from CFD simulations. Details on computing the curvature of a gas-liquid interface, implementing contact line dynamics, performing physics extraction, and coupling gas-liquid flow calculations with uncertainty quantification we be discussed.